Today, one of the major problems of human societies is the increase of amount and diversity of waste, due to environmental pollution and health hazards. The waste contains all waste from human and animal activities, and the range of these wastes is so large that it can be found from general wastes to the most hazardous chemical and biological contaminants. Among the various types of produced waste, health-care waste, hospitals, research centers are very important due to the presence of a variety of hazardous compounds, and their harmful and significant effects on health care stuff and surrounding population. Among these resources, hospitals, in spite of the low number, produce the highest amount of medical waste. These are the most important health-care institutions that have led to the increase of waste in recent years due to population growth, the increase of clientele. Thus, quantitative and qualitative features of health care waste have been changed and are becoming increasingly toxic. The World Health Organization (WHO) is classified hospital waste in eight groups including general, pathological, radioactive, chemical, infectious, sharps, drugs, and pressure vessels. Based on the definition of the US Environmental Protection Agency and the WHO, 10%–25% of these wastes classify as hazardous because these contain infectious, pathological, genotoxic, radioactive, toxic, and chemical substances, carcinogens, and materials with high content of heavy metals. The mismanagement of these wastes leads to the environmental pollution, water resources, soil, and air and also can cause ugly landscapes in the environment, growth, and proliferation of vectors such as mice and insects and the increase of transmission and spreading infectious diseases such as cholera, diarrhea, AIDS (HIV), and hepatitis B and C in patients, hospital staff, as well as people surrounding the hospital. Accordingly, to achieve the desirable health conditions, the existence of a comprehensive waste management plan is necessary. The hospital waste management plan is including separation, collection, temporary storage, transportation, and disposal of waste., The management of these wastes, such as their proper separation, should be trained and monitored by the responsible persons and the waste producers carefully. Furthermore, the waste management plan includes issues related to crisis management and education, and the ability of waste producers to collaborate and control the spread of infection should be considered. Considering this important issue, the study of the management of hospital waste is one of the requirements of the health system. Many studies are conducted to management and measurement of hospital waste in Iran including Tabriz, Tehran,, Torbat-e-Hydareih, Sanandaj, Zanjan, as well as Turkey, India, and Korea. For example, Taghipour and Mosaferi. revealed that the total hospital waste in Tabriz was 3.48 kg/b/day. The total hazardous and general wastes in their study were 1.039 and 2.493 kg/b/day, respectively. Furthermore, the quantity analysis of waste showed that food waste (35.72%) had the highest weight. Sajadieh Hospital of Torbat-e Jam is located in Razavi Khorasan Province and it welcomes many visitors from the surrounding cities and villages daily and given that, until now, no comprehensive study has been conducted in this field; therefore, this study conducted to survey of the quality, quantity, and management of these wastes. Sajjadieh Hospital is affiliated with the Ministry of Health (MOH) and Medical Education, which was built in 2002 in the city of Torbat-e Jam, Razavi Khorasan Province. The total number of occupied and approved bed in this hospital is 160 and 96 number, respectively. This descriptive cross-sectional study was carried out to qualitative and quantitative analysis and waste management of Sajadieh Hospital of Torbat-e Jam in 2017. The quantitative and qualitative of waste were assessed for 3 months (2 samples/month and 16 wards). At each stage, general and hazardous wastes were collected in separate bags (general, infectious, sharps, and chemical and pharmaceutical waste in black, yellow, red, and brown bags, respectively). To determine the amount and percentage of waste produced, the part of the wastes collected in each wards was selected as the sample. Thus, the total number of 96 samples (general and hazardous) from different wards was brought to the temporary station and sample weight measured with a scale (PM Mettler model) with a precision of ± 100 g. To increase the accuracy of work, weighing in each section was carried out three times, and finally, the mean for each section was considered. To determine the qualitative status of waste, the percentages of plastic, paper and carton, textiles, glass, metals, and food waste were analyzed simultaneously. To know of waste management, the questionnaire from the Ministry of Health and Medical Education contains 75 questions and in 5 parts including separation and collection (45 questions), temporary storage (10 questions), transportation and disposal (20 question) were used. To convert the collected data into a quantitative value, score 1 was assigned to answer which was complied with the standard and score 0 was assigned to answer which was not complied. Then, different stages of hospital waste management were weighted according to their relative importance as shown in [Table 1]. Scores of waste management were scaled up in expert group according to [Table 2]. Finally, the data were analyzed using Excel software. Currently, Sajadieh Hospital of Torbat-e Jam has 160 occupied beds, and according to the results obtained, the amount of waste produced in this hospital varies from 0.07 to 1.05 kg per bed every day. Based on these results, the total of waste produced in this hospital was 658.9 kg including 261.4 and 397.6 kg hazardous and general waste, respectively [Table 3]. Furthermore, the highest and lowest values of hazardous waste are related to the operating room and specialized clinic with 32.9 kg/b/day and 5.8 kg/b/day, respectively. 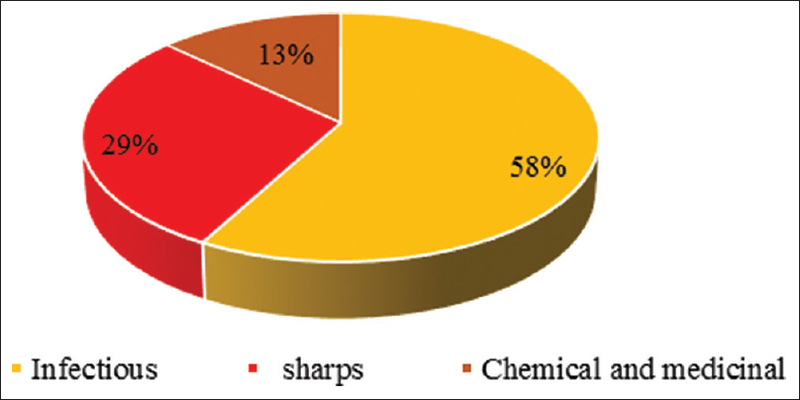 The percentage of hazardous waste including sharps, chemical and medicinal, and infectious is shown in [Figure 1]. According to this figure, the most percent hazardous waste of hospital is infectious waste with 59%. Of the total waste generated, 22% was infectious, 11% sharps, and 0.05% chemical and medicinal waste. Furthermore, frequency distribution of total waste components (hazardous and general) is presented in [Figure 2]. The highest and lowest values are related to food waste (25%) and pathological waste (6%), respectively. The results regarding the assessment of each stage of hospital waste management including separation, collection, storage, transportation, and disposal are presented in [Table 4]. According to the results obtained from the questionnaire, most of the studied hospital wards scored moderately in terms of the quality of their performance in all stages of waste management. [Table 5] shows the result comparison of the present study with other studies. According to [Table 3], the total amount of waste produced in hospital is 658.9 kg/day (4.11 kg/b/day) including 397.6 kg/day general and 261.4 kg/day hazardous waste (infectious 149.8, sharps 36.2, chemical and medicinal 74.7). In a study conducted by Taghipour and Mosaferi. the weight of total wastes, infectious and general waste obtained 3.48, 1.039, and 2.439 kg per bed every day, respectively. Dehghani et al. reported the amount of waste produced in Tehran educational hospitals as 4.42 kg/b/day which is somewhat consistent with the present study. Mohammad et al. measured the total waste generated in small and large hospitals in Bahrain. The results showed that the amount of total wastes was 0.038 and 1.177 kg/b/day, respectively. The results of a study in one of the China cities showed that the average amount of hospital waste was 0.5 kg/b/day. Furthermore, [Figure 1] shows that the highest percentage of hazardous waste is related to infectious waste with 58%, sharps with 29%, and chemical and medicinal with 13%. That contains 22%, 11%, and 0.05% of total wastes produced. Based on definition of the WHO, 85% of the waste produced in hospitals is safe and 15%–25% are hazardous waste (10% infectious and 5% chemical). High percentage of infectious waste in this study, more than standard values, can be due to improper separation of wastes by service staff and visitors and also a lack of adequate supervision on the waste separation and the mixing with other wastes. The results of study conducted by Bazrafshan et al. revealed that the total amount of infectious, sharps, and general waste was 51.6%, 1.2%, and 47.2%, respectively. The reason of difference between sharps waste in their study with the present study is related to hospital management system and provided trains to staff and other hospital staff. According to [Figure 2], the highest percentage of waste components in the hospital was related to food waste with 24%, plastic 17%, and paper and carton 15%, respectively. This result is similar to Hadipour et al. study in Amir-Al momenin Hospital of Ahwaz. 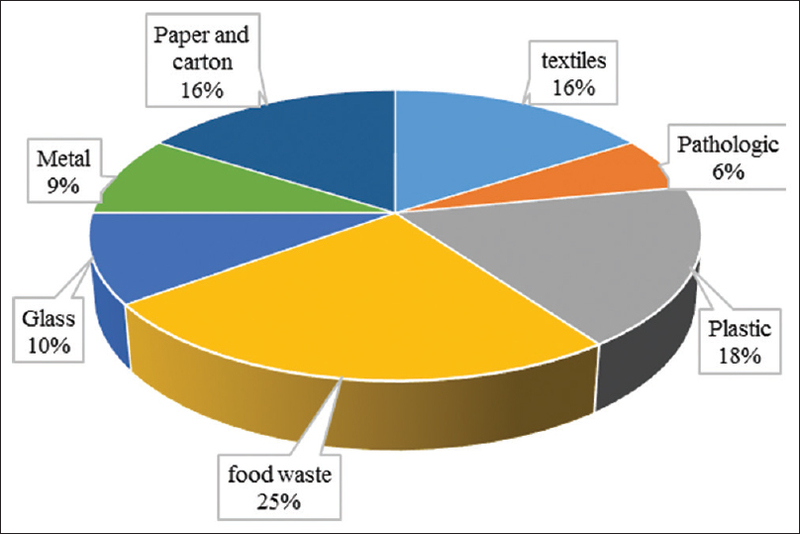 The highest percentage of waste components in Hadipour study was related to food waste (21%), plastic (16%), and paper and carton (14%), respectively. However, the highest percentage of waste in ShahidRajaee Polyclinic Hospital in Ahwaz city was plastic (19%) paper and carton (19%) and food waste (15%). Furthermore, in a study conducted by Sadeghi et al., plastic had the most weighted percent. The results of waste management questionnaire showed that in 58/3% of wards, production and separation of waste in the hospital were consistent with the standards of the MOH. Transportation status in the studied wards in 51.5% of cases was average and the practice of temporary storage in 89.6% of wards complied with existing standards. In total, the status of the hospital wards of Sajadieh in waste management practices was determined as average. Koushiar et al. assessed the performance of the hospital wards in waste management in Rasht city as 88.33% poor and only 33.3% moderate. Malek Ahmadi et al. studied the status of waste management in Tehran hospitals. The results showed that disposal stage in 8.3%, 5.6%, 4.9%, and 24.3% of wards was great, good, moderate, and very poor, respectively. The most important practice to achieve efficient and proper management is the reduction of waste generated through the purchase correct pattern, warehousing, distribution and consumption of equipment, knowing quantitative and qualitative properties of waste, separation, collection, and disposal of them according to the type of waste produced. This practice is different in various cities due to different factors such as the type of health care center, the hospital's specialty, the type of services provided by the hospital, the number of hospital beds, and the cultural and economic status of the community. One of the weaknesses points of waste management in this hospital was improper means of waste transporting to the final disposal site. Thus, distribution of waste and leachate in the collection pathway can cause the spread of pathogens and infectious agents. On the other hand, the weakness of personnel training issues, especially the service staff and the lack of proper supervision over their performance and the inattention of health-care personnel through the disposal of general waste into the infectious waste bags, has increased the percentage of infectious waste in the hospital. In a study conducted in private hospitals of Fars Province, 29% of hospital waste was infectious, due to the inadequate and improper separation and collection of waste and the low level of service personnel knowledge. Considering the high diversity and volume of hospital waste, especially hazardous waste, one of the most important and necessary actions to reduce of health and environmental problems and hospital waste management costs is proper waste separation plan and monitoring on correct disposal and sanitation of them. Furthermore, expansion of interdepartmental cooperation, especially the MOH, municipalities, Environmental Protection Agency, and training courses in the field of proper management of hospital waste can reduce the hazard potential of these wastes. Based on the results of the study, the total amount of waste produced of Sajadieh Hospital was 658.9 kg/day including hazardous (261.4 kg/day) and general waste (397.6 kg/day). The status of the waste management practices was determined as average, and in different stages of collection, temporary storage, transportation, and disposal in 58.3%, 89.6%, and 53.3% of wards were complied with the existing standards, respectively. Considering the high rate of infectious waste in the hospital (22%) compared to the WHO guidelines (10%), more and continues trains are necessary to reduce waste, proper separation of them, and reduction health and environmental problems. Dehghani MH, Dehghanifard E, Azam K. Quantity and quality of potential recycling of solid wastes in Tehran. Sci Health 2010;1:39-45. Oweis R, Al-Widyan M, Al-Limoon O. Medical waste management in Jordan: A study at the King Hussein Medical Center. Waste Manag 2005;25:622-5. Koolivand A, Mahvi A, Azizi K, Binavapour M, Alipour V. Quality analysis and management of health-care waste-products. J Hormozgan Univ Med Sci 2010;14:72-9. Chartier Y. Safe Management of Wastes from Health-care Activities. Australia: World Health Organization; 2014. Ferdowsi A, Ferdosi M, Mehrani MJ. 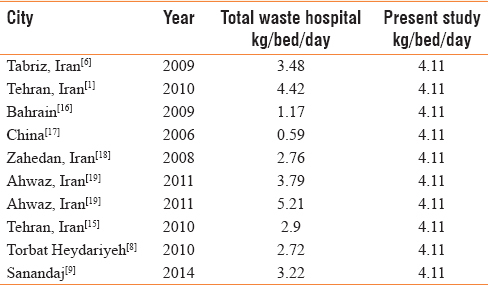 Health-care waste management status in Iran (case study of Gachsaran County, 2012-2013). Int J Environ Health Eng 2016;5:21. Farzadkia M, Moradi A, Mohammadi MS, Jorfi S. Hospital waste management status in Iran: A case study in the teaching hospitals of Iran University of Medical Sciences. Waste Manag Res 2009;27:384-9. Nafez AH, Ebrahimi A, Nejad MH, Bina B. Quantity and composition of produced dental solid waste in Isfahan, 2011. Int J Environ Health Eng 2014;3:17. Taghipour H, Mosaferi M. Characterization of medical waste from hospitals in Tabriz, Iran. Sci Total Environ 2009;407:1527-35. Omrani A, Imandel K, Karimzadegan H. Study on solid waste collection and disposal in hospitals and health care centers of Tehran province. Iran J Public Health 2008;27:61-5. Alavi N, Mohammadi M, Vosoughi Niri M, Salimi J, Ahmadi Angaly K, Ghaffari Zadeh F, et al. Survey of quantity and quality of medical waste during in Razi Hospital of Torbat-e-Hydareih, Iran. J Torbat Heydariyeh Univ Med Sci 2010;1:32-40. Mohammadian Fazli M, Nassiri J, Nabizadeh R. Qualitative and quantitative assessment and management of hospital waste in Zanjan, Iran in 2011. Iranian J Health Environ 2012;6:55-64. Birpinar ME, Bilgili MS, Erdoǧan T. Medical waste management in Turkey: A case study of Istanbul. Waste Manag 2009;29:445-8. Patil AD, Shekdar AV. Health-care waste management in India. J Environ Manage 2001;10:20-31. Jang YC, Lee C, Yoon OS, Kim H. Medical waste management in Korea. J Environ Manage 2006;80:107-15. Ministry of Health and Medical Education. Criteria and Methods of Executive Management of Medical Waste and Related Waste. Tehran: Ministry of Health and Medical Education; 2008. Malek Ahmadi F. Survey of Medical Solid Wastes in Tehran Hospitals. Tehran: Tehran University of Medical Science; 2010. Mohamed LF, Ebrahim SA, Al-Thukair AA. Hazardous healthcare waste management in the Kingdom of Bahrain. Waste Manag 2009;29:2404-9. Cheng YW, Sung FC, Yang Y, Lo YH, Chung YT, Li KC, et al. Medical waste production at hospitals and associated factors. Waste Manag 2009;29:440-4. Bazrafshan E, Kord Mostafapoor F, Rakhshkhorshid A, Kamani H. Survey of Medical Wastes Management in Zahedan, 2008. Proceeding of 12th National Congress on Environmental Health. Tehran, Iran; 2009. Hadipour M, Afkhami M, Takdastan A. Identification and measurement of hospital waste materials and classification of them according to WHO criteria (Case Study: Amir-Al Momenin Hospital and Shahid Rajaie Polyclinic of Ahwaz). J Jundishapur Health Sci 2011;3:39-51. Koushiar G, Nabizadeh R, Omrani GA, Nikoomaram H, Monavari M. A comprehensive survey on the present status of hospital waste management in Iran: A case study of Rasht. J Appl Sci 2006;6:721-5. Askarian M, Vakili M, Kabir G. Results of a hospital waste survey in private hospitals in Fars province, Iran. Waste Manag 2004;24:347-52.